Abnormal function within the spinal framework generates mechanical stress. Accelerates the wear and tear on the surrounding spinal muscles, ligaments, discs, joint and other spinal tissues. Decreased organ function, inflammation, decreased motion or mobility, pain, tenderness, muscle spasms, cramps, dis-ease, and ultimately DISEASE. 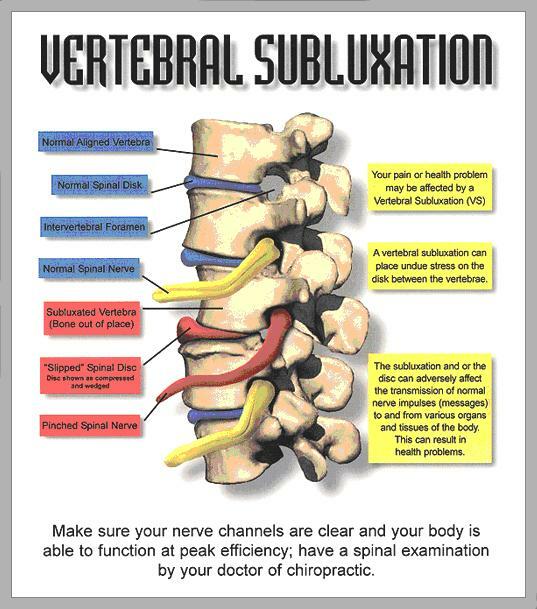 Additionally, because of the direct mechanical and physiological relationship between the spinal column and the spinal nerve roots, vertebral subluxations as well as other spinal abnormalities decrease nerve function. Once nerve function is compromised, communication within the body becomes less effective, decreasing the overall health and wellness of the individual. Your nervous system (brain, spinal cord, spinal nerves) controls and coordinates all of the functions of your body. The nervous system is the way your body communicates with itself. Messages are sent from the brain, down the spinal cord, out the nerve root to your organs and muscles; and vice versa. If the messages and signals traveling over your nerves have any interference, parts of your body will not get the proper nerve messages and will not be able to function at 100% of their innate abilities. In other words, some parts of your body will not be working properly. Dr. Lizie applies Chiropractic to locate interferences (subluxations) and to reduce or correct them. Over a series of chiropractic adjustments specifically designed to correct the vertebral subluxations in your spine, the function of your internal messaging system is restored. Chiropractors are the only professionals who undergo years of training to be the experts at correcting subluxations.